Q. I have a bunch of apps on my iPhone that don’t work on iOS 11, and I don’t seem to be able to manage apps in iTunes anymore over USB. Do I have to delete these one by one on the phone as I find them, or is there a faster way? A. Apple’s recent iTunes 12.7 update removed the ability to buy and manage iOS apps on the computer, although you can still sync movies, TV shows, music, contacts and calendars when the phone is connected to the Mac or PC with a USB cable. App management on iOS devices is now done directly on the iPhone, iPad or iPod Touch, and you can also remove built-in Apple apps that you never use, like the Home, Stocks or Watch utilities. Apps that were never updated by their developers for the current iOS 11 software appear on the home screen with a small download-arrow icon next to the name. When you tap the app icon to open it, you see a message about the app needing an update — and are given the option to keep it or delete it. You can delete multiple apps in one session by pressing an app icon until all the icons on the screen begin to wiggle around and a small “x” appears in the corner of each icon. Once the wiggling starts, tap the “x” next to any app you no longer want or need to get to the Keep or Delete box before moving on to the next outdated, wiggling app. 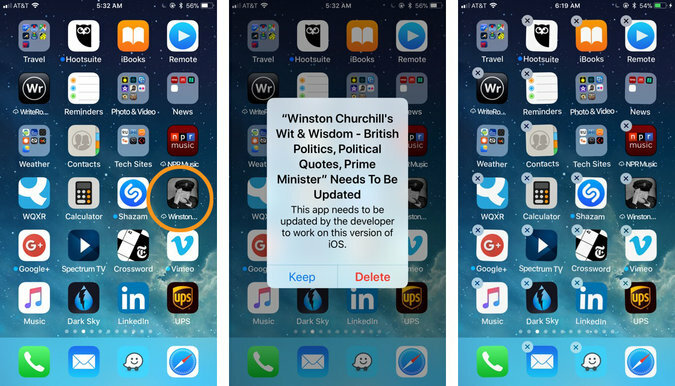 Although you do not see the download-arrow icon signifying outdated software, you can also remove unneeded apps by opening the Settings icon on the home screen and selecting General and then iPhone Storage. Below the screen options to offload photos and unused apps to save space on your device, you get a list of all the installed apps that shows how much space they take up — and when they were last used. To delete an old app, tap its name to select it and then tap Delete App on the next screen.